. . : N O R D I S K P E R L I T E - Wino : . .
Perlite is the generic name for a naturally occurring siliceous volcanic rock, which we take into our new a modern factory outside Copenhagen in shiploads. Here we are manufacturing the filter Perlite in one of our special kilns at temperatures of around 1100 °C, whereby the original raw material is expanding up to 20 times its original volume, and we achieve a new product : a white, sterile granular with many properties and many areas of use. Average Particle size from 7µ - 35µ = covering from the finest to the coarsest products on the market. Perlite filter aid qualities is an amorphous material, without crystalline particles, i.e., no lung injuries, no allergy, no skin irritation ,when using our products and qualities. 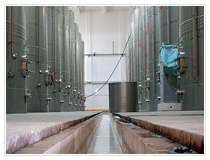 Perlite filter aid is designed for use in any diatomite or powder type filtration system, i.e. both for pressure and vacuum filtration equipment, simply by replacing present filter aid with our filter Perlite - so simple! 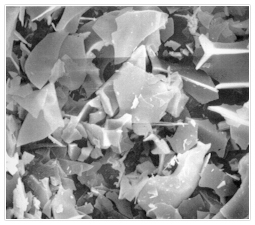 Of particular importance in vacuum systems is our Perlite filter aid’s resistance to precoat cracking. In almost every major industrial filtration application, our Perlite filter aid has proved remarkably efficient. The ability to filter “hard-to-clarify” liquids while maintaining maximum “flow rates” has built a record of performance unequalled by most competitive filter aids. Filtration of beer and the way filtration is done differs from brewery to brewery! It is cost effective to change filter aid media from diatomite earth or Kieselguhr to Perlite filter aid. Our Perlite is on average 20 – 25% lighter in weight than the diatomite material. 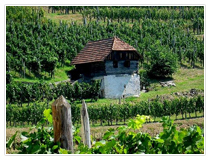 At filtration properties one looks at the volumes rather than weight, which is why the consumption of the “filtering aid” is reduced considerable. The cost savings are around 20 – 25% when using our Perlite filter aid. Inert Material: Max 1.0 ml/50gr. Solubility: Soluble in hot concentrated alkali or HF. Moderate soluble (<10%) in 1 N NaOH. Slightly soluble (<3%) in mineral acids (1N). Very slightly soluble (<1%) in water or weak acids. Filtration is the separation of solids from liquids by forcing the liquid to flow through a porous medium and depositing the solids on the medium. A filter aid is a finely divided material which, when added to the liquor to be filtered, helps control flow and solids removal. The septum, usually screen or cloth, serves principally as a support for the cake. The filter aid forms a porous layer on the septum and thus the filter aid is the filtering medium that traps the solids being removed and prevents them from blinding the septum. Filter aid filtration is mechanical, not chemical in nature. Irregularly shaped particles interlace and overlay in a fashion that leaves 85 to 95 % voids or open spaces. These voids forms billions of microscopically fine interstices between the filter aid particles. 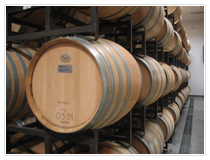 The size of these openings is so minute that the unwanted solids are strained from the liquid. The vast number of openings compensates for their small size resulting in fast flow rates and brilliant clarity. Good filter aids are light in weight, chemically inert and form high porosity filter cakes to maintain free flow of the liquid. The structure of the particles must be such that they will not pack too closely. This not only permits high initial liquid flow but also provides pore spaces to trap and contain the filterable solids and leave a high percentage of channels remaining open for flow. Particle size distribution must be tailored to permit pre-coating on coarse wire and yet give the desired flow rate and clarity. 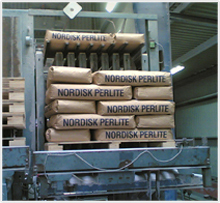 Nordisk Perlites Filter aids are available in a variety of grades to suit the solids removal requirement of nearly any application. In pictures below its possible to see how Perlite filter aid works, and Perlite filter aid particles enlarged. Clarity is considered by many engineers to be the most important measure of efficiency in filter aid filtration. A high quality filter aid is most important for uniform results day after day. Selection of the particular type and grade of filter aid having the correct particle size and distribution is a major factor. After these come many considerations such as the quantity of filter aid to be used; flow rate needed to meet plant production schedules, equipment limitations and general filtration conditions. All of these can best be resolved by tests using the actual liquid involved. 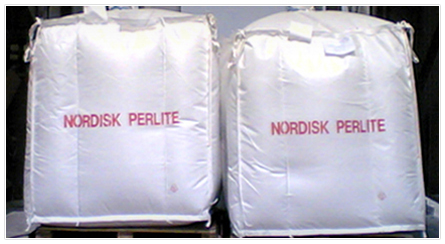 Contact us at Nordisk Perlite or contact our distributor to get more details as to which qualities we recommend in the brewing industry. 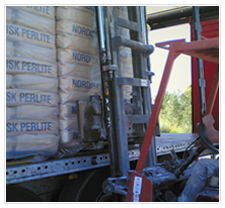 The Perlite filter aid is available in paper bags, big-bags and bulk. We supply to fit your present situation. PERLITE FILTER AID FOR THE BREWERIES IS THE RIGHT PRODUCT TO USE NOW AND IN THE FUTURE. FILTER PERLITE IS A COST EFFECTIVE FILTERING AID, COMPLETELY HARMLESS TO HUMAN BEINGS AND THE BEER. CAN YOU AFFORD NOT TO USE FILTER PERLITE!